Coming to clay with a background in drawing and painting, I delight in the ability to wrap a sketch around a functional object. This object, used continuously in the daily ritual of nurturing the body through food and drink, can now nurture the spirit and imagination as one takes in the subtle brush strokes, hand-drawn lines and lush colors of the floral surface designs. This current line of dinnerware is inspired by my many trips abroad. 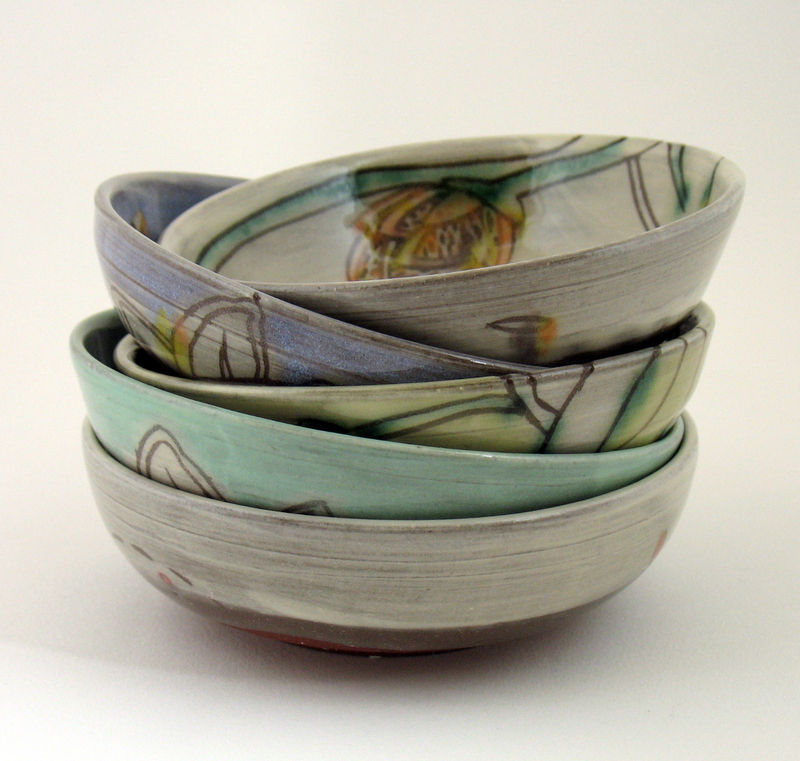 In the rain forests of Costa Rica I fell in love with the rich saturation of color, the dense moisture-laden air, and the wild free flowing shapes, all of which have been translated into the glaze and surface design of this ware. Japan taught me of the beauty of serving, the interest in varying form, and the subtle grace of brush stokes. Finally, Thailand and Indonesia’s textiles greatly inspire my desire for patterning, color and floral motifs. Conclusively, this dinnerware is a culmination of all the beauty I’ve seen and experienced and is meant to inspire joy and fanciful daydreams in those who use it. This is the beautiful and mysterious cycle of life that pulls me into the garden each spring, captivating my attention through the lushness of summer, the deadly frosts of fall and into the quietness of winter. In my ceramic work, I am driven to permanently capture the seasonal beauty of Nature’s forms and colors as well as the daydreams they inspire. My sculptural, terra cotta vases and wall hangings are clustered compositions of various hand-built floral forms meant to portray the fluidity, lushness and mystery of the botanical world. Most recently, through my art, I’ve felt the dire need to comment on environmental threats that continue to go unresolved. This can be seen in “The Price We Pay” series where our essential ecosystem has become drenched in oil and soot all for the extreme profit of an elite few. “Ocean Bloom” is a nod to the immeasurable value of clean drinking water and healthy, functioning ocean ecosystems. Finally, the “Hope” series references the chance for rebirth which follows every hostile winter. Through this process of renewal, pervasive fertile ground can be found to nurture the crucial seeds of change.